If you were tuned in to Minnesota Public Radio this morning, you might've caught Cathy Wurzer interviewing University of Minnesota Press director Douglas Armato about his thoughts on Apple's new e-reader, the iPad, its accompanying iBookstore, and the potential that e-readers have to change publishing for students, for publishers, and for the general reading public. I think the digital environment tends to level the playing field for all publishers because everything is available all at once. It isn't like going into a bookstore that may have copies of one publisher's book or doesn't have copies of another. That's really something that Amazon contributed to the book world — their ambition from the beginning was to have everything. And I think in Apple's iTunes you saw the same thing — the ambition to make everything available. What do you think about the iPad? 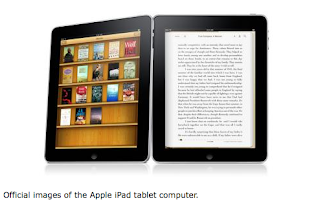 Do you have an e-reader, and if so, do you like it? Please share your comments below. For today's feature we've interviewed Matthew Biro, a professor of modern and contemporary art at the University of Michigan. Biro is the author of The Dada Cyborg: Visions of the New Human in Weimar Berlin, which was selected as a finalist for the College Art Association's Charles Rufus Morey Book Award of 2010. 1: In a nutshell, what is the Dada cyborg? The Dada cyborg is a motif or image type that I kept identifying in Dada art and, in particular, the work of the Berlin Dada artists. As I investigated Dada cyborgs and, simultaneously, the concept of the cyborg as it was developed in cybernetics and cultural theory after World War II, I came to the conclusion that the cyborg frequently appeared in Berlin Dada art because it could represent a new conception of hybrid or “networked” identity. By analyzing various appearances of the Dada cyborg between 1919 and the early 1930s, my book thus traces an emerging pattern of cultural activity that links Dada art with the rise of mass media as well as the (roughly) contemporaneous cultural theory of Georg Simmel, Walter Benjamin, Siegfried Kracauer, Ernst Jünger, and others. It is a concept of identity that appears across multiple media and shows us the roots of our own media- and conflict-saturated consciousnesses today. 2: The Washington Post recently named the 2006 Dada exhibition at the National Gallery of Art in Washington, DC, as one of the best shows of the past decade. It calls the Dada movement "the most radical, irreverent, rule-breaking movement in the history of Western art," and goes on to describe the movement as radically anti-elitist. Was the movement received differently in Berlin and, if so, how? And how does this recent characterization of Dada speak to your book and its contents? I was involved in the seminars sponsored by the National Gallery’s Center for Advanced Study in the Visual Arts (CASVA) that were part of the preparation for the National Gallery Show, and I think the curators, Leah Dickerman and Laurent Le Bon, did a fantastic job on the exhibition. The Berlin Dadaists were the most radical of the Dada movements in the sense that they were the most political; and their pioneering work in magazines, performance, photomontage, assemblage, and other media is extremely important to our understanding of both conventional and radical media today. The exhibition linked the Dadaists to the mass media, technology, World War I, and everyday life, and these are all important areas that I develop in my book. In addition, the show stressed their use of multiple media, something that I also emphasize. 3: Which was the most challenging chapter for you to write? Different chapters had different challenges. In Chapter 1, for example, for the sections on Dada performances, happenings, and media hoaxes, I had to read a lot of different sources in order to reconstruct what these ephemeral Dada artworks must have been like. In Chapter 2, on the other hand, the challenge was to develop a technical language that would adequately explain the various ways in which meaning is created through strategies of appropriation and montage. Perhaps the chapter that I found the most exciting to write was the last one; here my challenge was to rethink the Weimar photomontages of Hannah Höch in terms of their cyborgian implications. What I demonstrate here is that part of Höch’s continuing importance to Dada art lies in the radicality of her exploration of networked identity, which she represents as undermining differences between genders, species, and ethnicities. 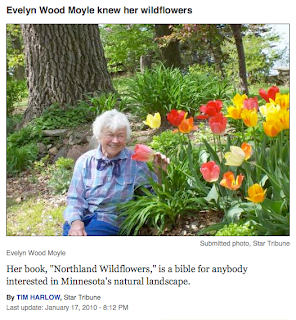 4: University of Minnesota Press refers to your book as a "prehistory of the posthuman." Can you expand upon this assessment? “Posthuman” is a term that arises in both science fiction and cultural theory to describe human beings from a radically social-constructionist point of view. It generally argues that traditional distinctions between genders, ethnicities, and species do not have to be obeyed, and that our identities are as much the product of the cultural scripts that we inherit from our environments as they are the results of our biological minds and bodies. More radical forms of posthuman theory hold that we are completely culturally constructed, a position that I do not agree with. My book is a “prehistory of the posthuman” in that it identifies a moment of cultural activity spanning art, theory, and the mass media in the 1920s in which an earlier — and, I would argue, highly important — concept of socially- and culturally-constructed identity was elaborated. And by examining the discourses, events, material culture, and institutions that influenced the development of the Dada cyborg, we may today perhaps understand some of the many challenges facing the development of both culture and identity in the contemporary moment. 5: What is the strangest form of material culture you came across in your research? That’s a very hard question to answer because the more you delve into Weimar culture in general the wilder, crazier, and more creative it gets. One thing I found particularly fascinating were the “soldier portraits” that were one of the inspirations for the Berlin Dadaists’ development of photomontage. These were portraits of soldiers in which a headshot was combined with some preexisting readymade image depicting an armored male body and/or a patriotic background. The most famous of these are collages of photographs with chromolithographic backgrounds (forms that the Dadaists describe in their letters and diaries), but, as I did more research, I soon discovered there were other forms as well. For example, there were many composite photographs produced before World War I that combined an ordinary soldier’s portrait with images of political and military leaders. I find these images quite poignant since they are essentially portraits of individuals who are combined with a “one size fits all” patriotic ideal. As such, the seem like metaphors to me for the fitting of the individual with all his specific hopes and desires into the military machine — a machine that destroyed millions of young men in the second decade of the twentieth century. For more information about The Dada Cyborg, click here. 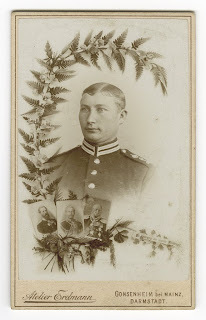 About the photo (above): Atelier Erdmann, Unknown Soldier (c. 1900). Composite photograph. Gelatin silver print on card stock, 2.5 x 4 inches. Reproduction by Matthew Biro. -Dorian Awards: Winner of Film of the Year and Performance of the Year (Colin Firth). 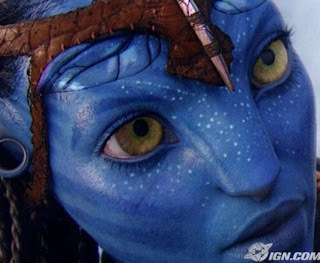 Unless you've made a deliberate decision to stay away from all news Hollywood in the past few months, you've likely heard about the wildly popular James Cameron film Avatar. And, if you're like me, you might have been baffled to learn that this much-hyped, clichéd flick (with its handful of scenes that ooze with Titanic-like corniness) actually won two Golden Globes: Best Director for Cameron, and—wait for it—"Best Drama." But there is one very recent piece of writing that has caused me to take another look at this film. Daniel Heath Justice, author of Our Fire Survives the Storm: A Cherokee Literary History, has written a piece for the First Peoples blog that highlights the potential this film had to "engage an audience on Indigenous issues that might not otherwise have been interested or receptive." Cameron's final product is indeed rife with missed opportunities to spark real conversations. But despite (or perhaps because of) this, it is a film worth further consideration. To be honest, I went in expecting to hate the film. I’d already heard that it was pretty much Dances with Wolves in outer space, and the heavy-handed parallels to Pocahontas and Last of the Mohicans were readily apparent even in the first half-hour. The minute I saw Michelle Rodriguez as the tough-talking pilot Trudy Chacon, I knew that her character was going to die, die heroically but die nonetheless–this is the almost inevitable fate of most Latinas in science fiction films. For all the amazing 3D effects, the characters were simplistic caricatures, much of the dialogue was leaden and cliché, and the storyline was surprisingly predictable for a $300 million epic. To my surprise, there was enough in terms of world-building and interest around the Indigenous Na’vi to keep my interest; indeed, I would have liked to have seen much more of the Na’vi and their world and much less of the generally obnoxious and self-absorbed human invaders. The film didn’t annoy me so much as make me sad, largely because it promised to be much more substantial than it actually was. Today's post is by Armand Peterson, author of The Vikings Reader. He, like many other nervous Minnesota Vikings football fans out there, is anxiously awaiting the NFC Championship game this Sunday. For Minnesota Vikings fans looking forward to the NFC Championship Game against the New Orleans Saints on Sunday—with my apologies to Charles Dickens—it is the best of times, and it is the worst of times. “Best” because Brett Favre has ignited fan excitement for the Vikings we haven’t seen since 1998. And “worst” because you know what happened back then—the sure-thing 15-1 Vikings lost a heartbreaker in overtime to Atlanta in the NFC Championship Game. Frankly, even in the aftermath and euphoria of the 34-3 drubbing of the Dallas Cowboys last Sunday, many fans are afraid of what will happen in the Louisiana Superdome. There are a lot of similarities between the 1998 and 2009 Vikings. Both had star-studded rosters. Ten Vikings made the Pro Bowl team in 1998, and five were voted to the First-team All-Pro squad: quarterback Randall Cunningham, wide receiver Randy Moss, guard Randall McDaniel, defensive end John Randle, and kicker Gary Anderson. Similarly, in 2009 ten Vikings have made the Pro Bowl team. (There were nine originally, but defensive back Antoine Winfield was just added to replace Arizona’s injured Dominique Rodgers-Cromartie.) Running back Adrian Peterson, guard Steve Hutchinson, defensive end Jared Allen, and defensive lineman Kevin Williams made the All-Pro team. Furthermore, Randy Moss was the NFL’s Offensive Rookie of the Year in 1998, while Percy Harvin won the honor in 2009. The 1998 Vikings scored a then-record 556 points, but the 2009 squad was no slouch. They scored 470 points, second only to—ouch—New Orleans, who scored 510. The odds makers have made the Vikings four-point underdogs. That’s not surprising, since we’re playing on the road—where the Vikings were only 4-4 in the regular season. The Saints, who have only been in the playoffs seven times in their 43-year history (the Vikings are 26 of 49), are the sentimental favorites because of the team’s role in restoring civic pride in the aftermath of Hurricane Katrina. The Superdome has been the site of six Super Bowls, but this is the first time the Saints have even played in a conference championship game. The noise in the fixed-roof Superdome this weekend could be even louder than in the Metrodome last Sunday, and should give the Saints players a huge emotional advantage. And, as if they needed any extra incentive, the Saints feel they were snubbed when only four of their players were selected to the Pro Bowl team. Things seemed stacked against our Vikings. What’s a fan to do? So I’m investing all my emotional capital in this game. It’ll break my heart if we lose, but think about it, training camp will start again in about six months. -Think you know your Vikings trivia knowledge? Take The Vikings Reader Challenge, a quiz compiled by Peterson. While Tom Ford's A Single Man, sadly, did not win a Golden Globe in any of the three categories in which it was nominated, we are keeping our fingers crossed for its potential at the Oscars. Nominations for the Academy Awards will be announced two weeks from today, on Tuesday, Feb. 2nd. -"If A Single Man can be criticised for anything it is for being too beautiful - music to the ears of fashion's most fabulous perfectionist." Article in The Telegraph. -Colin Firth on how proud he is of the film, and how a very moving scene left the camera crew speechless. -Firth at the Golden Globes, and how he very nearly missed his chance at the role of George Falconer. 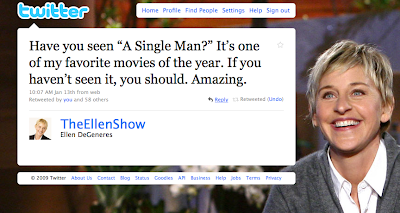 -Follow A Single Man on Facebook (and check out the new featurette on Apple). -Read the novel by Christopher Isherwood. If the recent wide-release of Pedro Almodóvar's Broken Embraces has sparked your interest in this acclaimed and exciting filmmaker, we'd like to point you to our recent publication All About Almodóvar: A Passion for Cinema, edited by Brad Epps (professor of Romance languages and literatures at Harvard University) and Despina Kakoudaki (assistant professor of literature and film at American University). This book not only offers new perspectives on Almodóvar's artistic vision and influences from a variety of contributors, it also includes a chapter by the director himself, taken from his own diary account of the making of Volver. Find more book information here. If you're still not convinced, here are 11 more reasons to see Broken Embraces. The continuum of Suzanne Lacy’s career mirrors the history of contemporary art: performance, installation, activism, social practice, and public engagement. An internationally regarded artist whose work includes installations, video, and performance, Lacy has addressed issues of sexual violence, aging, incarceration, illness, poverty, and a range of social-justice issues for almost four decades. Beginning in the early 1970s as a student at University of California, Fresno, and then in the Feminist Art Program at California Institute for the Arts, she was an integral and pioneering member of the Women’s Studio Workshop, Woman’s Building, and other important landmarks of feminist art. Since then, Lacy has maintained a career resolute in its commitment to feminism and social change. The University of Minnesota Press is pleased to announce that it is publishing the first in-depth exploration of the dynamic work of this radical artist, Suzanne Lacy: Spaces Between, by Sharon Irish. What's more, both Lacy and Irish will be at UMP's booth at the College Art Association to sign copies of Irish's book on Thursday, Feb. 11th, from 12:00 - 1:00 p.m. All attendees are encouraged to visit us at booth #208. We hope to see you there! Find more information about the book, which will be out in early February, here. If you've been following this blog regularly, you've likely seen a lot of information about the movie tie-in edition of Christopher Isherwood's A Single Man that we've recently published. What hasn't been covered in any great depth is the fact that this book is a very valuable tool to teach in the classroom. Until now. What is astonishing about this part of the novel is that Isherwood anticipates the discourse on diversity in higher education from the last 20 years. Rather than paper over the differences he sees in the classroom, Isherwood calls for acknowledgment and discussion of diversity. As to the issue of hating without a cause, George says: "A minority is only thought of as a minority when it constitutes some kind of a threat to the majority, real or imagined. And no threat is ever quite imaginary. … There always is a reason, no matter how wrong it is." George is talking about the Jews and blacks present in the classroom, but his subtext includes the gay minorities too. Isherwood's wishful thinking here is for real engagement instead of benign tolerance. In the wake of the attempted airplane bombing on Christmas Day, Mark Salter has written an op-ed piece for The Globe and Mail to explain new airport security techniques. Salter, who is editor of Politics at the Airport, argues, rather controversially (he admits), that a new piece of technology, the "back-scatter" x-ray (which draws up a naked image of each passenger) actually contributes to the enhancement of individual privacy. Security analysts have sarcastically suggested that the only way to ensure aviation security is to fly naked. But the new technology gives the best possible security screening of passengers and several system tools to protect passengers' privacy. It may be difficult to see how an X-ray that strips your clothes for a screening officer protects your privacy, but there are four crucial parts of the system that provide security and ensure that privacy invasion is minimal. 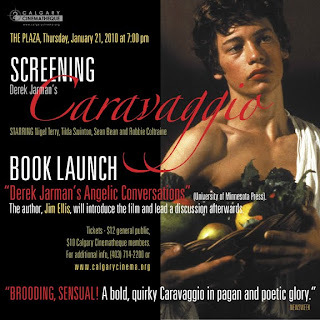 One of the most successful films by iconoclastic filmmaker Derek Jarman, Caravaggio (1986), will be screening at 7 p.m. on Thursday, Jan. 21st, at The Plaza Theatre in Calgary. The film helped launch the careers of Tilda Swinton, Sean Bean, and Robbie Coltraine, and its title character has been coined by Newsweek as "a bold, quirky Caravaggio in pagan and poetic glory." The screening event will happen in conjunction with the book launch for Derek Jarman's Angelic Conversations by Jim Ellis, who will introduce the film and lead discussion afterward. 1: Cary Wolfe poses with the cover poster of his high-in-demand (not to mention hot-off-the-press) book, What is Posthumanism?. 3: Author John Protevi (whom you might remember from this post) stands with his book, Political Affect (vol. 7 in the Posthumanities Series). 4: Sidonie Smith and Julia Watson have a chat with University of Minnesota Press director Douglas Armato. Smith and Watson are authors of Reading Autobiography, which will be out in a second, expanded edition in March. 6: Don Pease, author of The New American Exceptionalism, hangs out with friends in front of his poster. 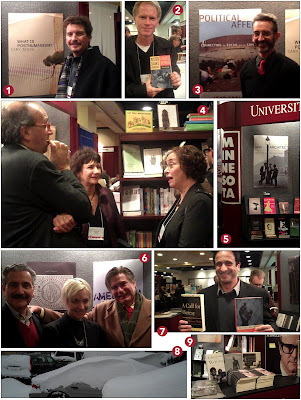 7: A Call for Heresy and We Are All Moors author Anouar Majid is all smiles at UMP's booth. 8: Treacherous holiday weather was one popular topic of casual conversation at the conference. Here is evidence as to why our direct marketing coordinator was late in getting to Philadelphia via North Dakota and Minnesota. 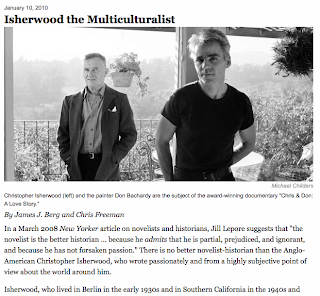 9: Our A Single Man / Christopher Isherwood display included Isherwood on Writing (edited by James J. Berg), Isherwood's Christopher and His Kind, and Kathleen and Christopher, a collection of Isherwood's previously unpublished letters to his mother. Looking for more MLA info? Check out Jennifer Howard's assessment in The Chronicle and Serena Golden's article in Inside Higher Ed, Tweetup at the MLA.